The biggest Vegas event ever will be the largest gathering in the history of Las Vegas: +RockinRio, the world biggest music festival. 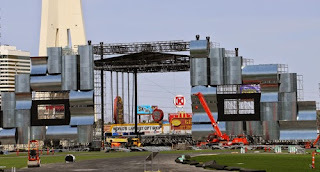 For that to happen, Vegas is building the Las Vegas City of Rock in the heart of Las Vegas, and it will be ready for the RockinRio USA which will open in in May 2015 and will last 4 days over 2 weekends. Las Vegas City of Rock, Rockland, will be filled with attractions bringing the best of the U.S., Brazil and UK. Some of the attractions: concerts on the Main Stage, rousing beats on the Electronic Stage, unique rhythms on the Rock Streets. There also will be bars, shops, rides, dance battles and delicious food. Rock in Rio's inaugural event broke music festival records with 1.38 million attendees. Since that monumental concert, 13 RockinRio festivals have taken place across three countries with more than 7 million people attending and 1 billion more watching at home around the world. The City of Rock, an area of 250 thousand square meters was built especially for the RockinRio. Last year's festival in Rio sold out all 600,000 tickets in just four hours. RockinRio is also the world's biggest music festival on facebook with over 10 million followers.